Preserving a bog habitat on peat sites, for instance, a healthy, wet peatland site can help absorb CO2 from the atmosphere. From the 1950s onwards grips were dug for drainage of bogs. Either to help with access for farm machinery or, by drying out the land, to favour conditions for heather or grass grazing. Grips are straight drainage channels dug into the ground, often visible on aerial maps as they form a herringbone pattern. 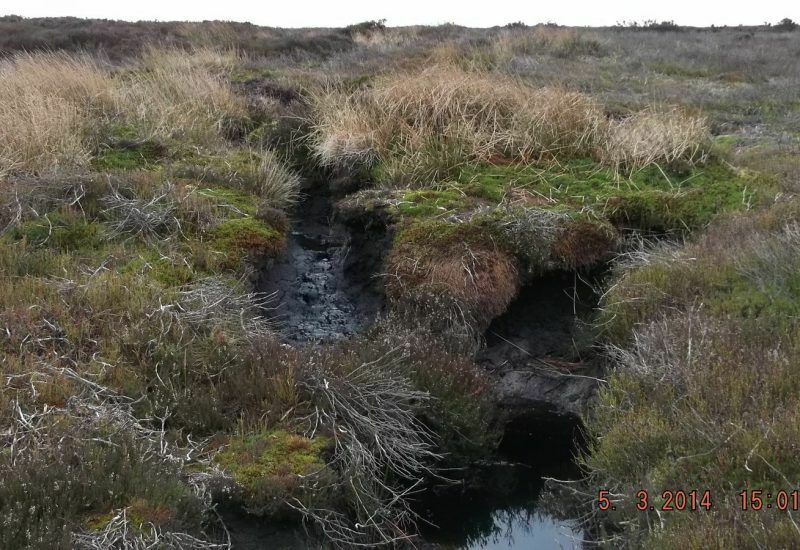 These days we recognise the value of preserving a bog habitat on peat sites, for instance, a healthy, wet peatland site can help absorb CO2 from the atmosphere. 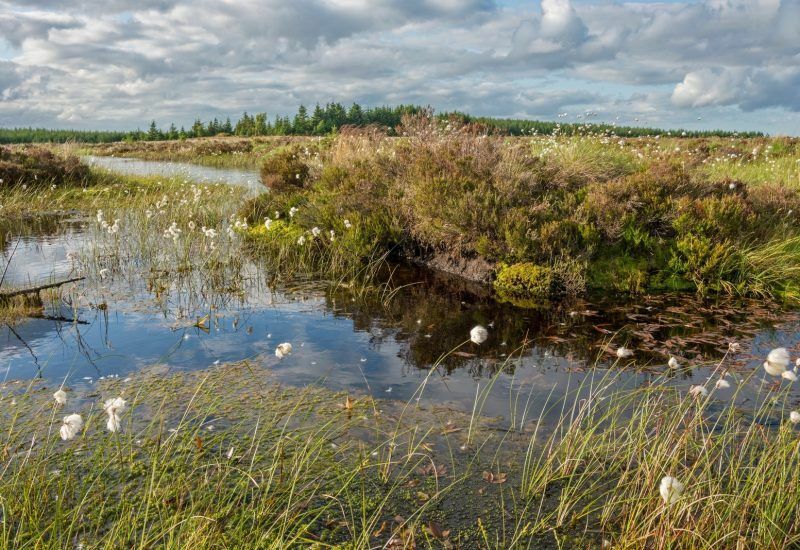 Keeping peatlands wet also helps regulate water flow and water quality further downstream. Also, with the potential for hot, dry summers around the corner, it is important to have wetter areas to help invertebrates and bird chicks during those dry spells. Here is all the information about how we are working hard to restore and preserve wet peatland sites around the Park. The sphagnum moss which slowly forms peat likes wet conditions – it likes the Northumberland hills! Peat forms as a rule of thumb about 1mm/year. We can take peat depths at some sites (simply by sticking a pole into the ground) and at some sites in the Border Uplands the peat is over 7m deep! This means the blanket bog started forming in about 5000 BC, a time when early man was just thinking about becoming farmers. 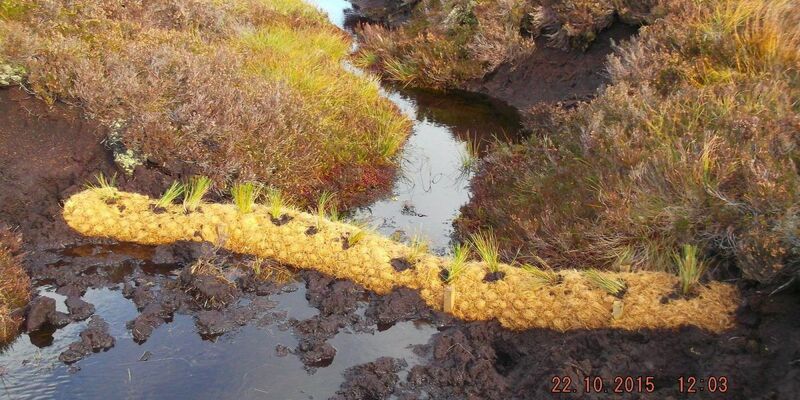 Grip blocking can be done by making a dam out of the peat every 10 metres or so. Another technique is using a dam made out of timber or plastic piling. The dams are spaced closer together if there is a slope, so that that water trickles back onto the land and makes ideal conditions for the sphagnum moss. Every winter for the past few years we have organised a grip blocking project. Why is the work done in winter? That is when the birds are not nesting. 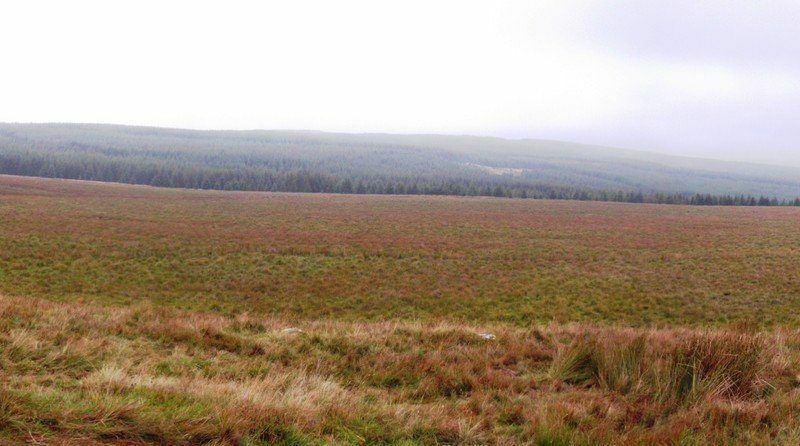 We have also restored blanket bog by removing Sitka Spruce that self-seed onto sites. The trees can either be chipped and the chippings scattered (they absorb water and the mosses like to grow on them), or brashed on 2 sides and laid down on the bog. We know of other sites where Sitka need to be removed. In 2014 we discovered a new record of rare fungi. It is so rare it doesn’t even have an English common name! It is called Byssonectria terrestris. 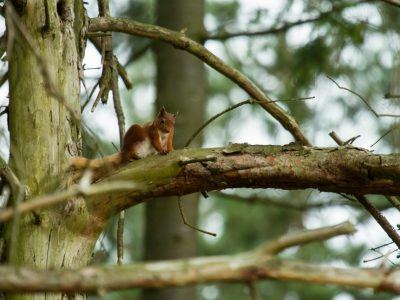 It is a small cluster of orange pinheads and it likes quite a specialised habitat involving burnt wood and deer urine. This was the first record for Britain this century, in fact there are only five other instances of it in Britain since records began in 1871. It often isn’t listed in many British or European books, because it is so rare. The sample was sent to the National Collection in Kew for preservation. 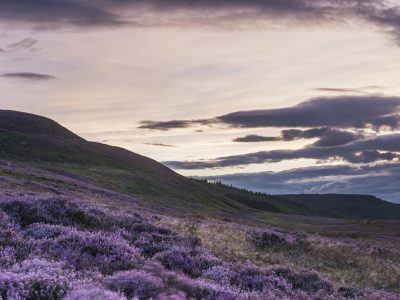 In 2015 we organised a large-scale stone pitching and flagging project on Simonside, to protect the peat from being washed away into the Coquet. You can read more on the blog. 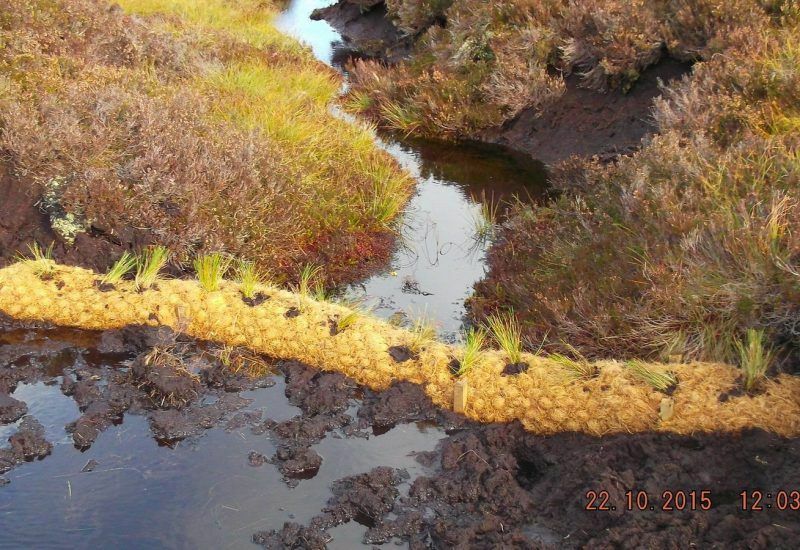 Also in 2015, coir logs were installed on a remote part of Whitelee Moor National Nature Reserve, with volunteers from the Northumberland Wildlife Trust and the National Park working together. Coir comes from coconuts and is a pH neutral fibre that can be made into ‘sausages’ or logs, and secured to the bottom of the shallow, wide gullies. Within only a few weeks later, the coir logs are trapping sediment really well and reducing the speed that rain water will reach the River Rede. Did you know that peat grows at about 1mm a year? So 1m of peat represents 1,000 years! We have sites that are about 9m deep, and elsewhere in Northumberland there are sites over 10m deep. This means the sphagnum started growing in these places at the same time as the glaciers were retreating since the last ice age. We have also collected over 80 peat depth locations. It is an interesting history lesson, to pull the peat stick out and think about what was happening in Britain at the time – the start of settled farming around 4000 BC, the first stone circles were put up around 3000BC, Bronze Age Britain with bronze weapons and tools around 2000 BC and small villages forming around 1000 BC. Every year, during climate change week, local school children take part in a Moorland Indicators of Climate Change field visit (MICCI). 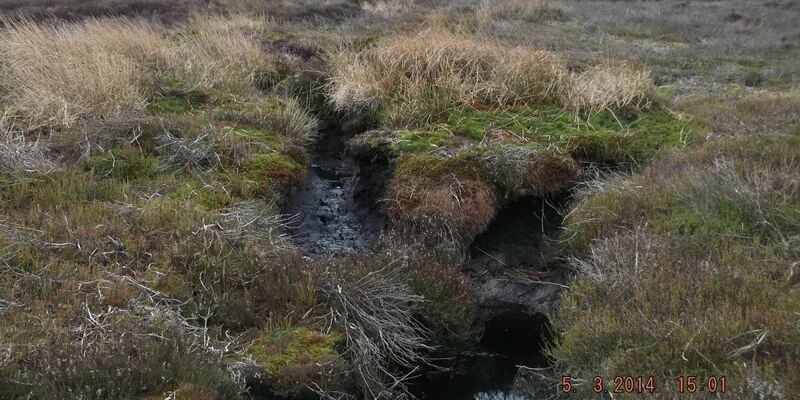 The science includes measuring the temperature and pH of the blanket bog water, taking water table measurements, identifying moorland plant species and taking peat depths. In other National Parks, other school children are doing the same. The results are used by real researchers looking at moorland conservation. 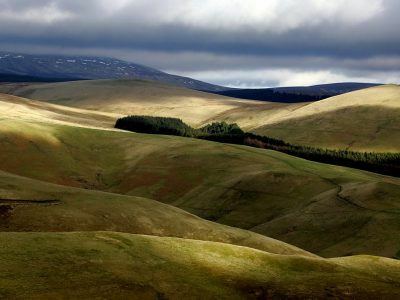 Learn more the restoration of the Border Uplands area. Exploring the Park historic landscape.